If you’re like most people, buying a home evokes a myriad of emotions: excitement, nervousness, happiness, uncertainty, and the list goes on. For many of us, buying a home is one of the biggest investments we will ever make. So, not only do we have to go through looking at properties, negotiating the contract, and closing, we also want to make sure that we’re making the right decision. This guide will hopefully settle some of those nerves by giving you the step-by-step process for buying a home (with an emphasis on Spanish Fort). Not only do I live and work in Spanish Fort, I’ve been selling homes for 13 years. My whole business revolves around one single principle – It’s all about you! My mindset is a “client first approach”. Please read on and if you have any interest in buying a home now or later on down the road, you’ll find all of my contact information at the bottom of this page. Spanish Fort is the smallest of the major cities of Baldwin County but you would never know it with all of the activity that’s going on. The area is exploding with growth. Of course you’ll see a number of existing neighborhoods but there are also quite a few brand new subdivisions that are being erected all over town. Currently we’re seeing approximately 30-40 home closings every month in Spanish Fort which is pretty impressive due to the overall size of the city. I believe the sustained growth stems from the great school system, proximity to the interstate, quality of homes, and affordable prices. Place your finger anywhere on the map and there will be plenty of real estate agents to choose from. As with any group of people, the number of different personalities, professionalism, and levels of skill will run the gamut. So, how on earth to you pick an agent that’s right for you? The chances are really good that your local friends, family, and co-workers have all bought a home in the past. Ask the people who you trust to see if they have any recommendations but be cautious. You always want to do your own due diligence while interviewing agents to see if they will be a great fit for you. What worked for Aunt Sally may not work for you. By doing a simple Google search, you’ll be able to quickly find Realtors who not only are established but who are also very savvy when it comes to the internet. An agent who has a big presence online and “up with the times” will only benefit you because they are taking their business seriously and subsequently busy. You want to work with a busy agent, not a part-timer. You want to find a Realtor who is not only very experienced but also one who’s personality best works with yours. How well do you know the real estate market? Find Out What Type of Agent They Are? You’re probably thinking, “Huh?”. Well, this is valid and it’s important. There are basically three kinds of agents: one who represents the buyer, one who represents the seller, and one who represents both parties in a single transaction. You want to stay away from the last one. For instance, if you happen to attend a model home or open house, you will run across the agent who solely represents the seller. They are bound to look after the best interests of the seller, not you. So the remedy is simple. Work with a Buyer’s agent. This is a Realtor who will fight for your interests only, getting you the best price and terms. The best part is this. All commissions are paid by the seller. The seller is actually paying for you to have your own representation through a quality Buyer’s Agent. Of course it’s always best to sit face to face but from here in Spanish Fort to all the way down to the beach, many of our home buyers aren’t currently local. In this case, a phone consultation would suffice. The bottom line is to nail down exactly what you need and want. I’ll spend a great deal of time identifying your needs and wants. My goal is to get you everything that you need and as many “wants” as possible within your maximum price point. There may be a particular Spanish Fort neighborhood that you prefer. You may only want a home with granite countertops, a fenced in yard, and a pool. A pool for you may be a need but is a want for other people. It’s important to write down everything that is important to you. I’ll provide you with a tailor made search within a system that will allow you to be notified of any new matches that meet your criteria. This system actually goes a little further than that. See all listing activity that matches your criteria, including price changes. View property details and all pictures of the property. Mark a property as “Favorite”, “Possible”, or “Reject”. You’ll be able to email the listing, make a comment, share on Facebook, request a showing, and get a Walkscore. See the history of the listing. Use a mortgage calculator and calculate payments. See Community Information including population, housing inventory, demographics, weather, education, employment, fair market rents, and crime. This is an amazing tool that I know you will find very useful. Here’s an example of what your page will look like……. You should always line up your financing well before you start looking at properties. There’s a couple of reasons why…..You may qualify for less than the homes you’re considering, which is real deflating if you happen to fall in love with a particular property. You may qualify for more (if you’re comfortable with the payment). The initial process is actually quite simple. Choose a lender who you already know and trust OR ask your Realtor. A seasoned agent will usually have several lenders who they recommend. Personally, I have 4 loan originators who I present to buyers. All of the lenders who I work with are local and can definitely help you finance a home in Spanish Fort. Just like interviewing a Buyer’s Agent for the job, you should do the same for loan officers. Find How Much You Can Afford? 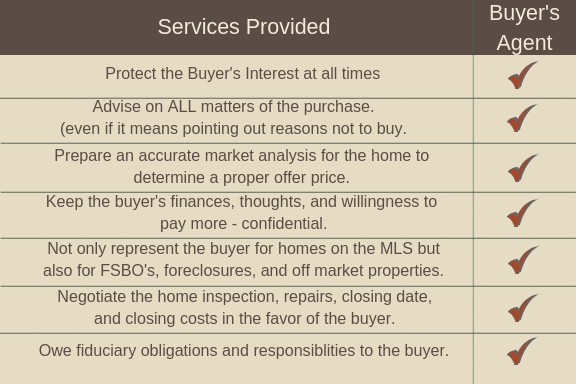 Here are some key factors to come into play when buying a home. Your down payment will usually be one of the biggest out of pocket expenses but depending on your situation and where you’re buying, you may qualify for $0 down payment. Usually the down payment for a primary residence is either 0%, 3%, or 5%. Check out this link for an article about the various loan programs that are available. 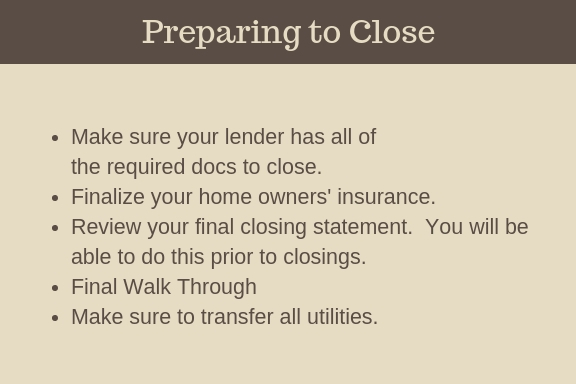 Depending on the sales price of your new home, your closing costs can be several thousand dollars or even more. However, just remember that having the seller pay for your closing costs is an option and can be negotiated. Everything is negotiable between the buyer and seller. Once you find a lender who you’re comfortable with, you’ll want to start the process to get approved. In the beginning, you can get “pre-qualified” with just a short conversation over the phone with your loan officer. But, you need to take it one step further in order to be ready to write an offer. You will get “pre-approved” when the lender is actually able to verify everything that you told them over the phone. Your Pre-Approval Letter is what a seller will want to see along with your offer. Remember, this whole process is ALL ABOUT YOU! As mentioned above, YOU get access to all of the properties that are available. I will never pressure you to choose a particular property. YOU get to select the properties that you want to see in person. YOU choose when you want to see them. YOU will have all of the data about the property including what the seller initially paid for the home, how long they have owned it, and any other information that is not readily available to the general public. YOU choose the time to tour homes that works best for your schedule and I’ll do everything else. This includes organizing the listings in the most time efficient manner, schedule the appointments, and accompany you on the tour. Once you have found THE home, it’s time to go to work making an offer to the seller. I will do a thorough market analysis of the property looking not only at homes that have recently sold in Spanish Fort but also homes that are on the market and properties that have been withdrawn or expired. This research will give you the information you will need to make an intelligent decision on price. Yes, we all want a deal but unless the seller is under duress to sell, current market conditions and the condition of the property will play a big role on price. For instance in Spanish Fort, current market conditions show that we are in a “slight” buyer’s market. Meaning, buyer’s are able (on average) to realize around 3%-4% off of the sales price. Conditions change so please contact me to see what the real estate market conditions are right now for Spanish Fort. 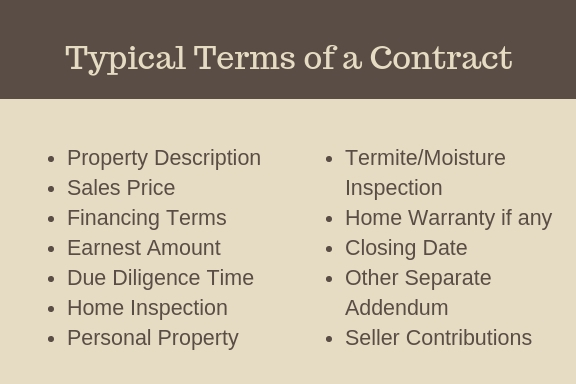 Below are typical terms of a contract, most of which can be negotiated between the buyer and the seller. After we draft the offer based on my recommendations and your direction, I will then submit your offer to the seller along with your pre-approval letter, and a copy of your earnest money check. The seller will then either accept, counter, or reject your offer. A counter offer is by far the most common reaction from the seller and that’s another occasion where my expertise and knowledge will be benefit you. My goal for you is to assist you in purchasing the house that you want, to get the best price, and to get you the best terms. Once you and the seller agree to all of the terms of the contract, your best interests will be protected through the due diligence time period. During this time there will be inspections, an appraisal, and negotiation of repairs (if any). From the day the contract is accepted you will have a certain period of time (usually 7 to 15 days) to have any inspections completed and to get your repair requests to the seller. The cost of a home inspection from a qualified professional usually runs between $300-$500, depending on the size of the home. Although a home inspection is not mandatory, there is never an occasion when I will recommend that you don’t obtain one (even when purchasing new construction). Important to Note: All homes will have something wrong with it but the home inspection is mainly needed to uncover any major problems or damage with the property. The seller may agree to all of the requested repairs, some of them, or none of them. It’s all about the negotiation. Just as with the initial offer, I will negotiate on your behalf to get as many repairs made as possible. If you and the seller can’t agree on what repairs are to be addressed, you will be able to walk away from the contract and not lose your earnest money. Always remember, the home inspection has to be completed AND the repair requests given to the seller before the inspection time runs out. Prior to closing there will be a few tasks to take care of during the last few days. This a really important step that shouldn’t be overlooked. The purpose of the Final Walk Through is to verify that all agreed on repairs were in fact completed. This is also the perfect time to make sure that no new damage was created during the contract period (damage from moving, contractors, etc). The property should at least be the same or better than the day you signed your offer to purchase. When the big day arrives, you will probably just meet with your Realtor and the closing agent. In most cases, at least here in our area, the buyer and the seller never meet in person. Make sure to bring your driver’s license and a certified check for any funds that you’re supposed to bring to the table. 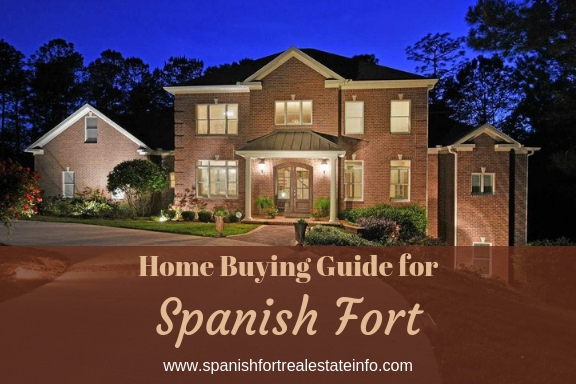 I hope that you have found this Home Buying Guide for Spanish Fort helpful. Please contact me from the information below if you are considering a purchase in this great city.